Wide Asleep in America: When Brainwashing Backfires:Military indoctrination at Nazi death camps stokes…universal democratic values! Military indoctrination at Nazi death camps stokes…universal democratic values! 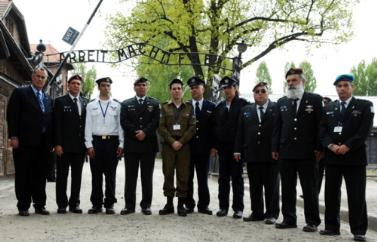 From Ha'aretz, "Study: IDF officers less committed to Jewish values after visits to Nazi death camps." The headline and subsequent report exposes unsatisfactory indoctrination levels in IDF soldiers. The study found that before going on the trip, officers expressed a very high level of commitment to the Jewish people and to preserving their Jewish heritage, and high levels of solidarity with the fate of other Jews. In contrast, they expressed a lower - though still high - level of commitment to more universalist ideas, such as understanding the universal context of the Holocaust. After they returned from the trips, however, the researchers found a drop in commitment to all values related to Jewish identity, including the importance of the Land of Israel for the Jewish people, the importance of the IDF's existence, feelings of national pride in being Israeli, and a sense of a shared Jewish fate. The study found a particularly dramatic decline in the importance the officers attached to Jewish and Israeli symbols, and to Diaspora Jewry. The trips also produced a decline in IDF-related values, including commitment to the state and the army, feelings of leadership, and love of heroism. In contrast, the trips produced no change in the officers' commitment to universal democratic values such as human dignity, the sanctity of life and tolerance. As a result, Ha'aretz reports, "Army sources said they were 'stunned' by the findings, which seem to indicate that the trips are achieving the opposite of their declared purpose." Note how the bad news of the report is that, following mandatory trips to Nazi death camps, tribalist and exclusivist ideologies decline while ideas "such as understanding the universal context of the Holocaust" and a "commitment to universal democratic values such as human dignity, the sanctity of life and tolerance" remain as strong. It places 'democratic values' in a different social context, though. 'Parliament' is a corruption of 'parlez-ment' : a place for talking. Note that leaves power for action missing from the equation - especially in a Thieves' World. I noted at one point that the loudest objections to 'Holocaust Studies' were coming from - wait for it - a Jewish foundation studying the history of the Holocaust. It's enough to decapitalize the concept. The Shoah Foundation and Steven Spielberg did a 13 part series called, "Days of Remembrance," gosh, I tear up just remembering it, and there were survivors who were kids at the time telling their stories. I watched part way through the first, but my heart was so broken, I did not want to watch anymore, but I then felt I should know what happened&then watched each remaining episode, sobbing through most of it all. I could not believe how the human species could have lost their humanity and become so calloused and so barbaric as to carry out such monstrous acts against fellow human beings. Of the 6 million Jews, 1.5 miilion of those Jews were kids. I saw mothers laying dead with their dead infant babies in their arms in the pits dug expressly for the purpose of disposing of the innocent people in this tragedy. Then recently, I have been looking into what happened/and is happening to the Palestinians even today, they are still being ethnically cleansed of their land and abused. I thought of the series I watched and I saw parallels, of the Zionists tactics as being no different from what the Nazis did to the Jewish people and my heart again breaks, but for a group that is being abused at the hands of those who were abused just 68 yrs ago. Perhaps every citizen of Israel should watch the "Days of Remembrance" and those Jews in the Zionists name who are committing the abusive acts could get back their humanity.